In this transcendent memoir, grounded in tribal myth and ancestry, music and poetry, Joy Harjo, one of our leading Native American voices, details her journey to becoming a poet. Born in Oklahoma, the end place of the Trail of Tears, Harjo grew up learning to dodge an abusive stepfather by finding shelter in her imagination, a deep spiritual life, and connection with the natural world. She attended an Indian arts boarding school, where she nourished an appreciation for painting, music, and poetry; gave birth while still a teenager; and struggled on her own as a single mother, eventually finding her poetic voice. Narrating the complexities of betrayal and love, Crazy brave is a memoir about family and the breaking apart necessary in finding a voice. Harjo's tale of a hardscrabble youth, young adulthood, and transformation into an award-winning poet and musician is haunting, unique, and visionary. We usually meet every 4th Tuesday. Bookworks is pleased to host Joy Harjo for the paperback release of her memoir, Crazy brave. In this transcendent memoir, grounded in tribal myth and ancestry, music and poetry, Joy Harjo, one of our leading Native American voices, details her journey to becoming a poet. Born in Oklahoma, the end place of the Trail of Tears, Harjo grew up learning to dodge an abusive stepfather by finding shelter in her imagination, a deep spiritual life, and connection with the natural world. She attended an Indian arts boarding school, where she nourished an appreciation for painting, music, and poetry; gave birth while still a teenager; and struggled on her own as a single mother, eventually finding her poetic voice. Narrating the complexities of betrayal and love, Crazy brave is a memoir about family and the breaking apart necessary in finding a voice. Harjo's tale of a hardscrabble youth, young adulthood, and transformation into an award-winning poet and musician is haunting, unique, and visionary. Part of Native Innovation: Indigenous American Poetry in the 21st Century, a landmark symposium bringing together a new generation of Native American poets in a convocation of readings and conversations for an in-depth look at the dynamic state of current Native American poetry and poetics in the 21st century. Featuring leading Native American poets and co-curated by Joseph Bruchac and Allison Hedge Coke, this event examines a range of issues, including native languages, traditional storytelling, formal innovation and Native American politics and much more. Joy Harjo was born in Tulsa, Oklahoma and is a member of the Mvskoke Nation. Her books of poetry include How We Became Human: New and Selected Poems, The Woman Who Fell From the Sky, and She Had Some Horses have garnered many awards, including the New Mexico Governor’s Award for Excellence in the Arts, the Lifetime Achievement Award from the Native Writers Circle of the Americas; and the William Carlos Williams Award from the Poetry Society of America. She has released four award-winning CD’s of original music and in 2009 won a Native American Music Award (NAMMY) for Best Female Artist of the Year. For more than 30 years, poet Joy Harjo, of Muskogee Nation heritage, has evoked the landscape of the Southwest with language steeped in American native cultures and visionary lyricism. From ancient, earth-centered rituals to contemporary challenges, she explores the lives and experiences of indigenous Americans with poignant, poetic brilliance. Visit chicagohumanities.org for ticketing information. Please note: Online ordering for this event has been turned off at this time. If you are still interested in purchasing books for this event, please call us at 480-730-0205 between 10am and 9pm MST. Thank you. 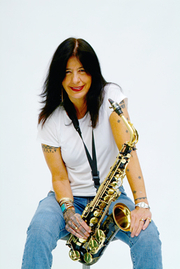 7PM MONDAY, JULY 23 Joy Harjo: Crazy brave ﻿Award-winning Muskogee Creek poet and musician Joy Harjo shares her memoir Crazy brave. Born in Oklahoma, the end place of the Trail of Tears, Harjo grew up learning to dodge an abusive stepfather by finding shelter in her imagination, a deep spiritual life, and connection with the natural world. She attended an Indian arts boarding school, where she nourished an appreciation for painting, music, and poetry; gave birth while still a teenager; and struggled on her own as a single mother, eventually finding her poetic voice. Narrating the complexities of betrayal and love, Crazy brave is a memoir about family and the breaking apart that is often necessary in finding a voice. PRE-ORDER TODAY online or at 480.730.0205 to secure your seat and place in the signing line. Click "add to cart" below and we'll reserve your book(s) and ticket(s) for in-store pickup before the event unless otherwise noted. EVENT TICKETS (free with book purchase from Changing Hands) will be called by assigned letter group to fill seats one hour before the event, two per ticket, and form the signing line after the presentation. Seats cannot be guaranteed for late arrivals. If available, seating opens to the general public fifteen minutes before the event, so please arrive early. CAN'T MAKE IT? If you'd like a signed book from any of our author events, please call us at 480.730.0205 to pre-pay and we'll have one or more copies signed and reserved for you or shipped anywhere in the United States and to most international locations. In this transcendent memoir, grounded in tribal myth and ancestry, music and poetry, Joy Harjo, one of our leading Native American voices, details her journey to becoming a poet. Born in Oklahoma, the end place of the Trail of Tears, Harjo grew up learning to dodge an abusive stepfather by finding shelter in her imagination, a deep spiritual life, and connection with the natural world. She attended an Indian arts boarding school, where she nourished an appreciation for painting, music, and poetry; gave birth while still a teenager; and struggled on her own as a single mother, eventually finding her poetic voice. Narrating the complexities of betrayal and love, Crazy brave is a memoir about family and the breaking apart necessary in finding a voice. Harjo s tale of a hardscrabble youth, young adulthood, and transformation into an award-winning poet and musician is haunting, unique, and visionary. Joy Harjo , For a Girl Becoming. Joy Harjo's book The Art of Losing was available from LibraryThing Early Reviewers. Joy Harjo is currently considered a "single author." If one or more works are by a distinct, homonymous authors, go ahead and split the author. Joy Harjo is composed of 5 names. You can examine and separate out names.